At his graduation from Deerfield High School, Michael Skaletsky was presented with the John F. Kennedy Award. 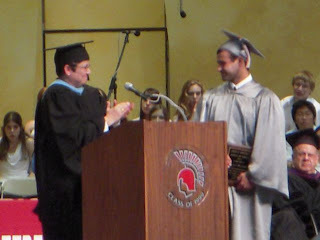 The award is for a graduating student who has represented himself with great honor and dignity throughout his high school career. We want to join in congratulating Michael and all of the NSC alumni who have graduated high school or college this month. Bully for the graduates! We wanted to take a moment on this Memorial Day to honor all those who have served our country and paid the ultimate sacrifice. We wanted to recognize both those Veterans who have lost their lives defending their country as well as all those who have served. Many of you are likely spending this Memorial Day with friends and family. We wish you a great holiday and look forward to seeing many of you in a few short weeks! 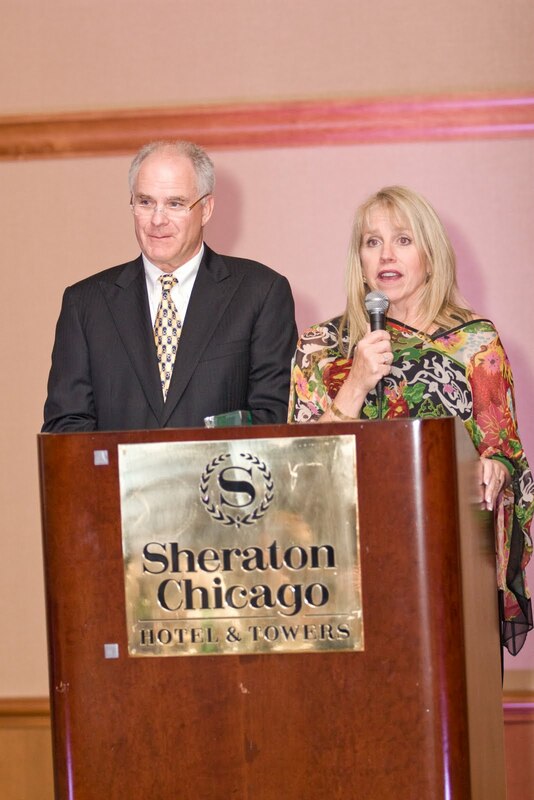 On April 16th, Leb and Sue were honored in Chicago by SCOPE Midwest. Along with Barbara and Richard Chernov of Birch Trail Camp for Girls they received a lifetime achievement award for their years of dedication to the camping movement. During the summer we see the work they do at camp, with Leb playing the A-B-C song, Sue as Inspector 12 and both working hard to make the summer special for every camper and staff. What most people don't get to see is the work they both do for the entire camping industry. It was a great evening at the Sheraton as the event was attended both by lots of North Star and Birch Trail folks as well as many others who support SCOPE Midwest. SCOPE works to send needy children to summer camps across the Midwest. While different than the Camp for All Kids Foundation that North Star is involved with, both programs help send kids to camp who otherwise would miss out. Both organizations do important work! The event itself was lots of fun. In addition to the awards being presented to Leb and Sue, Illinois Secretary of State Jesse White was on hand to present the Youth Advocate Award to Connie Payton, wife of the late Chicago Bears great Walter Payton. The Walter and Connie Payton Foundation is devoted to helping abused, neglected and underprivileged children. Connie was joined on stage by her children Jarrett and Bridget as they both shared their stories of their time at camp. The over 300 in attendance were told of the summer when Jarrett went through a bout of homesickness (his sister didn't) and pleaded with his dad to come and pick him up. No doubt that if Jarrett's counselors had been through one of Sue's pre-camp sessions they would have helped him no problem! We wanted to thank all the NSC folks who were in attendance. It was great to spend the evening with both recent NSC Staff as well as some old timers. In addition to Leb, Sue, Andy (and his wife Vickie) and myself, those in attendance with a connection to North Star included Mike Blumberg, Ari Goldberg, Karon Powell, Casey Lowman, Brian Glickman, Jake Segil and Carrie Langford, Nancy Becker, Leslie and Mike Cohen, Michael Geller, Lynette and Rory Gilbert, Arlene and Ray Handler, Michelle and Gary Kretchmer, Valerie and Keith Kretchmer, Mindy and Eddy Leshin, Eunice Lieberstein, Richard and Karen Reisin, and Lisa and Mark Schulman. Many others were unable to attend but were generous with their financial contributions to SCOPE Midwest. Thanks to everyone for their support! Special thanks to North Shore Photography for the pic of Leb and Sue! Want to stay comfortable on your camping trip? First, particularly for current 8th and 9th graders, who will either be going on the Canadian or Porcupine Mtns for their camping trips this summer... Do you want to avoid painful blisters on the trip? Make sure that your hiking boots are broken in. Whether you're buying a new pair of boots or have a pair from the past, its easy to avoid blisters and stay comfortable. Break in your boots starting now! Wear them in a bit. Its as easy as wearing them for an hour or two a handful of times when you're doing some walking (at the mall... around your neighborhood... etc). If you buy a new pair of boots and don't wear them until the day of your trip that's a recipe for blisters and foot pain. If you are buying new boots, there are lots of different kinds you can get. There is no reason to spend lots of money. Its always good to have ankle support and important to have a boot that grips well (many different kinds of boots have Vibram soles or similar brands). As important as the boots are a few good pair of socks. Wool or synthetic socks draw moisture away from the foot and also help keep the foot warm and comfortable when the sock is wet. Finally, a tip for EVERYONE on sleeping bags. While stuff sacks and compression sacks are great for making your sleeping bag nice and compact, you don't want to store it in the stuff sack. Stuff sacks and compression sacks are meant for the trip itself when storage space is limited. Storing the sleeping bag in a stuff or compression sack will break down the fill and give the bag "dead spots", all of which will make the bag less effective at keeping you warm on trips. The best way to store a bag is either in a large storage sack (often included with a sleeping bag), on a hanger or underneath your bed. A lot of great staff members are necessary to make a camp run smoothly. Our last several newsletters have detailed the counselors, trip leaders, and support staff who have committed their summers to making camp great. We're proud to introduce the administrative team that will be there to support those staff members and ensure that each of our campers has a safe and meaningful summer of 2010. Je ff returns to North Star for his 15th summer and his 6th as our CIT Director. In this role Jeff oversees our Counselors in Training and serves as a vital mentor to our youngest staff members. Jeff grew up across the lake from North Star as his grandparents owned a resort on Spider Lake, but didn't join us until he we needed a senior counselor in the middle of the summer. Jeff hasn't left since. During the off season, Jeff is a special education teacher in Denver, working with young adults. He's also known to play a bit of disc golf from time to time. Most importantly, he's the husband of Kim (our program assistant) and father of Lake. Mandy joins us for her tenth summer. She started out on our maintenance staff and we knew we found a gem when we saw what a great work ethic she has. Mandy is from Cadott, WI, just a few hours away from camp, however she has spent many of the last few off seasons living at camp. She's has a Masters Degree in Speech Pathology and has worked at the Hayward schools the past few months and for several years has worked with children from newborns to three-years-old with speech and hearing deficiencies. Mandy loves the Northwoods, but is currently interviewing with schools in Colorado. In addition to ensuring that we have a safe and efficient waterfront, Mandy is a certified lifeguard trainer and trains our staff. Caleb joins us for his second summer. He is currently at the University of Wisconsin-Madison and is hoping to join the Peace Corps. Caleb volunteers as a youth mentor as well as for Habitat for Humanity. Hailing from Neenah, WI, Caleb loves running and cross country skiing. He is also an avid hunter and fisherman. Caleb joined us last year as a wilderness trip leader, taking out one of our Canadian trips. His work ethic will be a great asset to our trips program and to camp as a whole. When the summer of 2010 ended, we knew the odds of Adam returning weren't high. He is graduating in a few weeks from The Ohio State University with a business degree and we knew he'd need to find full time employment. Adam accepted a position with Accenture and was scheduled to start in the middle of the summer... but when he was contacted by the company requesting he push back his start date to August 30th, it was an easy decision for him. Adam hails from Cincinnati, OH, and will be spending his 13th summer at North Star and his 3rd as a Village Director. He is an avid fan of Cincinnati sports (particularly the Bengals), the Ohio State Buckeyes, as well as the Milwaukee Bucks. When Jon decided that law school was in his future, we figured that there would be a chance that he'd be back. Jon will be attending Washington University in the fall and will return to camp for his third summer as a Village Director and his 12th overall. Jon's enthusiastic attitude is infectious and he makes life on "The Ridge" exciting for all campers and staff. Hailing from Deerfield, IL, Jon is a big Cubs fan and having spent the last four years at the University of Michigan, he's also an avid supporter of Michigan Wolverine Athletics. Ben join s us for his tenth summer at camp and his first as a Village Director. He grew up in Scottsdale, AZ, attending Chapparal High School, and currently is a junior at the University of Chicago. At camp Ben has been a tremendous counselor and has helped oversee our athletics programs over the past two summers. He brings a thoughtful sense of humor and intelligence to all that he does at camp. Ben has worked with all ages as a staff member and has played a big role in planning many of our special programs. Dan joins us for his third summer at camp, all three on staff. A recent graduate of Calvin College in Grand Rapids, MI, he hails from Willard, OH. He started out on staff during the summer of 2008 as a sailing instructor and also became a member of our climbing staff, serving as program head in 2009. Dan brings an upbeat, positive attitude to camp and great sense of humor. He has been accepted into the Masters of Student Development Program at the University of Iowa, and have also has been granted a Graduate Assistantship in Leadership Programs. ... to all the North Star Mothers (and Grandmothers). We wanted to take a few minutes to acknowledge everything that Moms do to make camp possible. We hope that all of our campers take a few minutes to thank their Moms for all the work they do to get their campers ready for the summer... from filling out lots of forms to shopping for camp clothes to labeling all of those clothes (particularly the socks). We hope you all have a great Mother's Day! The American Camp Association provides numerous resources for camp parents at their website CampParents.org. With camp fast approaching, we wanted to highlight a few of them for you. - Encourage your child's independence throughout the year. Practice separations, such as sleepovers at a friend's house, can simulate the camp environment. - Involve your child in the process of choosing a camp. The more that the child owns the decision, the more comfortable the child will feel being at camp. - Discuss what camp will be like before your child leaves. Consider role-playing anticipated situations, such as using a flashlight to find the bathroom. - Reach an agreement ahead of time on calling each other. If your child's camp has a no-phone-calls policy, honor it. - Send a note or care package ahead of time to arrive the first day of camp. Acknowledge, in a positive way, that you will miss your child. For example, you can say "I am going to miss you, but I know that you will have a good time at camp." - Don't bribe. Linking a successful stay at camp to a material object sends the wrong message. The reward should be your child's new found confidence and independence. - When a "rescue call" comes from the child, offer calm reassurance and put the time frame into perspective. Avoid the temptation to take the child home early. - Talk candidly with the camp director to obtain his/her perspective on your child's adjustment. - Don't feel guilty about encouraging your child to stay at camp. For many children, camp is a first step toward independence and plays an important role in their growth and development. - Trust your instincts. While most incidents of homesickness will pass in a day or two, Thurber's research shows that approximately seven percent of the cases are severe. If your child is not eating or sleeping because of anxiety or depression, it is time to go home. However, don't make your child feel like a failure if their stay at camp is cut short. Focus on the positive and encourage your child to try camp again next year. Read the May Siren on our Newsletters Page.